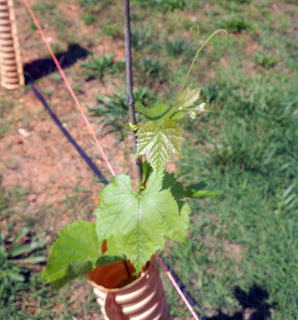 So far this spring the grape vines I planted this year are growing like crazy. 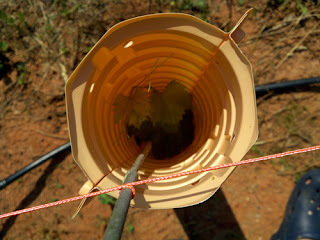 The Traminette has the most vigorous growth so far, already jumping out of the grow tubes. So far this variety is doing better than I expected, it will be a few years before I get some fruit from it, but I think these vines will be able to handle conditions here rather well. The vigorous growth could be the result of the root stock I chose, 101-14. Traminette is a variety that is not susceptible to black rot, and only moderately susceptible to downy or powdery mildew. Those three diseases are the most common I have deal with in my little backyard vineyard. The less I have to spray, the better. The Regent grape vines I planted are also doing quite well. They are on a less vigorous 3309 rootstock, but even still, considering they were planted a few weeks after the Traminette, are growing quite fast. The Regent is also more disease resistant than most Vitis Vinifera﻿, showing only a mild suseptibility to powdery mildew. I am looking foward to seeing how this vine progresses in the coming years, as while it is a hybrid grape, it has more Vitis Vinifera in its heritage than most other hybrids, and from what I have read, makes a great wine with cherry and black currant flavors. On the east coast, we have to spray grape vines quite a bit in order to have a decent crop of grapes to use for wine. This can be expensive, so it will be interesting to see with hybrid vines like these two, which will win out. 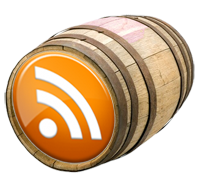 Hybrid wines or heavy chemical spray usage. Finally, my good ol' reliable Cabernet Franc vine is still going strong. This was the only row of Vitis Vinifera I kept in our vineyard. It grows so well here, but is very suseptibile to fungal diseases like Black Rot and Downy Mildew. 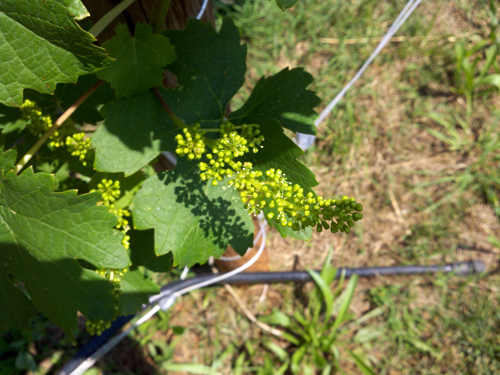 Here is an image of a grape cluster in pre-bloom stage on my vine. Maybe I will get enough grapes to make a little wine out of this year, if not, it does make an excellent jelly!